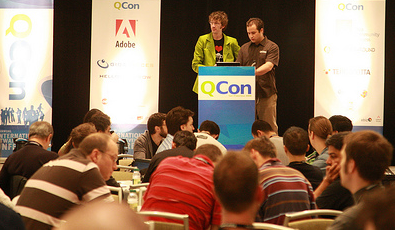 QCon is coming back to San Francisco.. This third annual San Francisco enterprise software development conference designed for team leads, architects and project management is back! Bloggers wrote about 32of the 60 sessions at last year’s event, read this article to see what the attendees said. There is no other event in the US with similar opportunities for learning, networking, and tracking innovation occurring in the Java, .NET, Ruby, SOA, Agile, and architecture communities. Denis Bregeon - I was very happy with it. Most of the talks tickled my imagination and that is the primary thing I was looking for. Many others gave me details on more technical subjects that I wanted to learn about. David Forbes - Exhilirated after gorging on brain candy this week, I have a moment to reflect on what just happened. QCon was the right place to be. I can't imagine where else I would have rather been. If I had the week to do again, I would probably march right down to the Westin...again. Brendan Quinn - The logistics were all great as usual, the wireless came thick and fast, and the food was pretty good -- ya gotta love that mid-afternoon ice cream run to keep the sugar levels high! Facebook, Linked-In, and other high scale & complex case studies. What kind of cool things are being done with Java and how does they influence language development? Scala, Clojure, Ruby, F#. New languages is en vouge again. As part of the Lean toolbox, Kanban provides an invaluable tool to reduce rework. Lennart Augustsson - "Strongly Typed Domain Specific Embedded Languages"
Kent Beck - "Just You Wait"
Martin Fowler and Rebecca Parsons - "Agilists and Architects: Allies not Adversaries Presentation"
Greg Young - "Unshackle Your Domain"
Martin Fowler and Zack Exley - "Democratic Political Technology Revolution"
Sign up to receive news updates about QConSF.